Rep. Armando “Mando” Martínez, D-Weslaco, and Sen. Eddie Lucio, Jr., D-Brownsville, recently welcomed members of the 2006-2007 Leadership Mid Valley Class, which visited Austin to gain further insight into legislation that impacts South Texas. One of those measures, House Bill 2510 by Martínez, could result in light rail passenger trains for the border region (see story later in this posting). The group, featured here on the south steps of the Capitol with Martínez and Lucio, include: Mónica Berry, Honei Deiu Blanco, Roel Campuzano, Anabell Cardona, Julie Crockett, Irma García, Jimmy Don Lawrence, Julie Majors, James Martínez, Hector Mejía, Norma Montalvo, George Piña, Lucia Regalado, Fernando Sáenz, Benito Sánchez, Jason Schoen, and Belda Villalon-Hill. A legislative locomotive could be taking off on Tuesday, March 27, when a measure that would allow the creation, maintenance, and financing of a light rail system – which would transport thousands of residents within, or between, the state’s 14 Texas counties which border Mexico – receives a public hearing in Austin before the powerful House Transportation Committee. 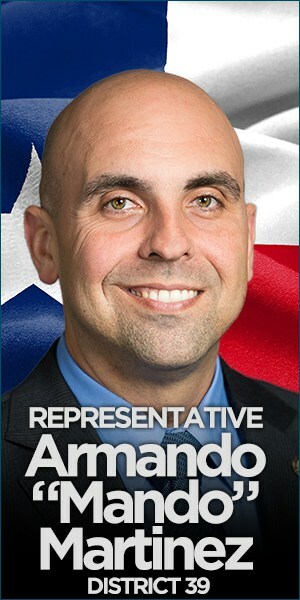 House Bill 2510, filed by Rep. Armando “Mando” Martínez, D-Weslaco, would give each of those border counties the power to create commuter rail districts – a governmental body – that could eventually usher a new concept in mass transportation for the region’s estimated 2.1 million residents. The bill, if approved by the Legislature, would hasten the arrival of a commuter line in the Lower Rio Grande Valley that would run from Brownsville to Roma, Martínez envisioned. In general, a light rail system uses special trains designed for urban travel, with capacities of up to 250 passengers per train, along with a bus system, to transport people and luggage while avoiding traffic congestion and other bottlenecks associated with larger population centers. In many cities along the border, a light rail system would provide many advantages, the lawmaker contends. Martínez says a light rail system along the border would be a major step forward in tackling traffic congestion and public safety concerns, and it offers a better option to toll roads. Martínez said it costs about $1 million to build one mile of rail tracks, and about $3 million to build one mile of road. The details of how the light rail system would be designed are not provided in his legislation. That responsibility would be left to a five-member governing board, which would be appointed by the local county judge and county commissioners. However, some basic administrative aspects are included in his legislation, such as a provision that would give the light rail districts the authority to issue bonds and address various forms of financing, and develop a coordinated park-and-ride bus service in conjunction with the train system. Although the commuter rail districts could tap into a wide range of funding sources, from federal grants to passenger fares, a county’s voters would have the final say, through a mandatory election, before any local taxes could be used to help pay for a light rail system. The system in the Valley would also use existing railroad tracks in order to save even more on construction costs. His plan, which he said he had been developing during the past year, has already picked up the political support of Hidalgo County Judge J.D. Salinas and the four county commissioners. On Tuesday, March 20, the judge and commissioners approved a resolution endorsing his legislation. Martínez has already cleared a major obstacle that faces most pieces of legislation – the legislative committee chairman, Rep. Mike Krusee, R-Round Rock, on Thursday, March 22, agreed to schedule the public hearing. “He is very excited about the legislation,” Martínez said. Sen. Juan “Chuy” Hinojosa, D-McAllen, and Sen. Eddie Lucio, Jr., D-Brownsville, are both very interested in carrying the legislation in the Senate, Martínez added. With state lawmakers now finished with drafting major legislation for action by the Legislature, the Texas Border Coalition will meet in Austin on Thursday, March 29, to begin a major push for its own agenda, which includes immigration, transportation, workforce, education and health care initiatives. “Now that the dust has settled, we can focus on h2ly promoting our legislative priorities and opposing those measures that go against the best interests of an estimated 2.1 million Texans who live along the state’s 14 counties that border Mexico,” said TBC chairman Chad Foster, who also serves as mayor of Eagle Pass. The meeting, which will be held at TBC’s Austin headquarters at 919 Congress Avenue, Suite 1500 (corner of 9th and Congress), will feature elected and community leaders from El Paso to Brownsville who are members of the statewide lobbying group. It will begin at 11 a.m. The Texas Border Coalition is a collective voice of border leaders and communities on issues that affect the quality of life along the Texas-Mexico border. 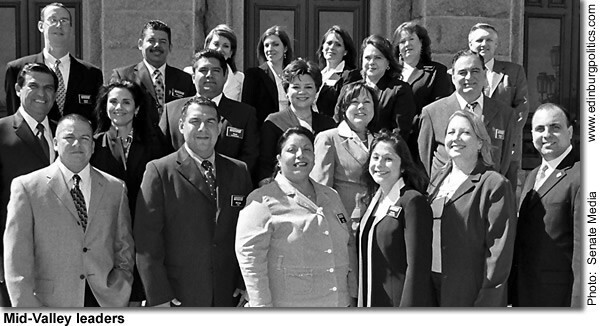 TBC develops and promotes major legislative initiatives to help the Texas border region grow and prosper economically. “The purpose of the meeting will be to discuss a number of critical legislative issues that affect our border,” said Mike Allen, TBC’s vice-chairman from McAllen. TBC’s agenda calls for several key legislative measures to be reviewed, and actions to take place. Strategic policy on transportation funding for the border, as well as the results of a recent meeting with TxDOT Assistant Executive Director Amadeo Sáenz, Jr., P.E., will be discussed. 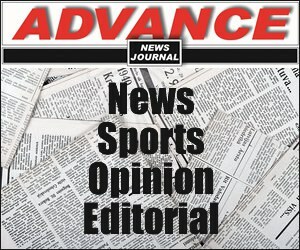 “There have been discussions for a user fee for commercial trucks traveling north bound and we believe this is a way of leveraging significant funding for transportation projects along the border,” said Maverick County Judge José A. Aranda of Eagle Pass, who serves as chair of the TBC Transportation Committee. In addition to transportation, immigration bills currently flowing through the legislative process will be discussed, as well as, a strategy to ensure the Legislature maintains a common sense approach on immigration issues, said Monica Stewart of McAllen, chair of TBC’s Immigration Committee. Plans to support workforce training funds also will be presented by Wanda Garza of McAllen, chair of the TBC Workforce Development Committee. Also, legislation regarding the Children’s Health Insurance Program (CHIP) will be reviewed. El Paso County Attorney José R. Rodríguez, chair of the TBC Healthcare Committee, noted that House Bill 109 by Rep. Sylvester Turner, D-Houston, was rescheduled for debate on the House floor on Monday, March 26. Passage of the HB 109 would help achieve one of the key healthcare goals of the Texas Border Coalition: the restoration of the 2003 cuts to the Children’s Health Insurance Program. The Texas Border Coalition has been an effective force in Austin and Washington, D.C., since it was first established in 1998. In addition to shaping major state policies and legislation in Texas, TBC also has established an influential presence in Congress, pushing for national measures ranging from increased funding for homeland security to protecting the flow of commerce and tourism into Texas from Mexico. 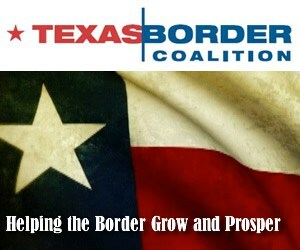 TBC maintains a web site at http://www.texasbordercoalition.org. •Mayor Joe V. Sánchez, City of Weslaco. Dolia González – mother of the late Marine Corps Sgt. 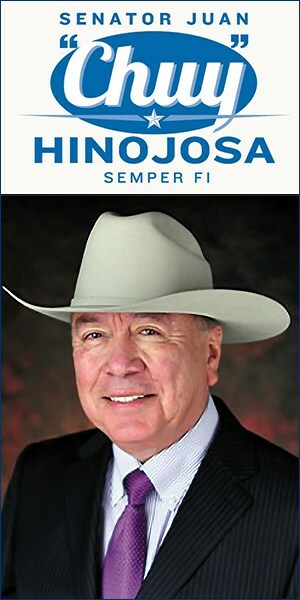 Alfredo “Freddy” González of Edinburg, a Medal of Honor recipient – will be the guest of honor at a book signing at 1:30 p.m., Friday, March 30, at the main exchange on Marine Corps Base Camp LeJeune, North Carolina. Ms. González, 77, was invited to visit the base for the book signing, and to see for the first time “González Boulevard” on the base that is named for her heroic son, killed at age 21 during the 1968 Tet Offensive. He was posthumously awarded the Medal of Honor for saving many fellow Marines under his command, over a three-day period, despite being seriously wounded several times in the days leading up to his final actions. The book is a biography titled “When The River Dreams”, and was published last October. The book signing will be held March 30-31 at the Camp LeJeune Base Exchange. The City of Jacksonville, near Camp LeJeune, is going to present a Mayor’s Proclamation honoring Dolia and her son. Commander Alistair Borchert, the commanding officer of the USS González – a $900 million warship based at Norfolk, VA – is planning to attend, and will be met by Col. Adele Hodges, commander of the base that houses 50,000 Marines – the largest in the world. Col. Hodges, an African-American woman, is the first female base commander in Marine Corps history. Information on the book and Sgt. González, and his mother, can be accessed at several web locations, including: http://www.authorhouse.com (look under book store); http://www.thehistorynet.com (type in Sgt. Freddy González); and at http://www.wikipedia.org, among many other sites. For more information contact: John W. Flores, 505-296-0428, or email chisholmtrail@hotmail.com; Or call Dolia González at 505-381-1157. Marine Corps Base Camp LeJeune contacts are: Kimberly Oliver at 910-451-2481 (ext. 6309), kimberly.oliver@usmc-mccs.org; or Megan Sanderson at 910-451-2481 (ext. 6394), SANDERSONML@usmc-mccs.org. Meanwhile, in Austin, legislation has been filed seeking to bestow upon González one of the most coveted honors in the state – the Texas Legislative Medal of Honor. Rep. Aaron Peña, D-Edinburg, has filed the legislation, which is awaiting a public hearing by the House Committee on Defense Affairs and State Federal Relations. Rep. Juan Escobar, D-Kingsville/Willacy County, is vice-chairman of that panel. The legislation, House Concurrent Resolution 121, would require the approval of the Senate and Gov. Rick Perry. Sen. Juan “Chuy” Hinojosa, D-McAllen, on Monday, March 19, passed legislation out of the Texas Senate that will help make public schools safer by guaranteeing that all school districts have defibrillator devices on every campus, as well as on hand at University Interscholastic League (UIL) sporting events to revive students who suffer sudden cardiac arrest. “There is no greater fear for a parent than the fear of losing a child. Statistically, we know that it’s only a matter of time before another student suffers sudden cardiac arrest. Now, when tragedy does strike, our children will have a much better shot at beating the odds and going home to their families,” said Hinojosa. SB 7 calls for public school districts to have an automated external defibrillator available on each campus and at UIL athletic events. A similar measure failed to pass in the last regular legislative session. Since then, several high profile incidents in which student athletes have collapsed during training exercises and competitions have brought increased attention to the issue. SB 7 would also require that certain school personnel, such as medical staff and athletic coaches and sponsors, be certified in CPR and defibrillator techniques. Not only will school employees be trained to save lives, but high school students, as well, will be taught CPR and defibrillator usage in their high school health courses. “Life-saving techniques are invaluable tools that teachers and students can learn in our schools and carry with them for the rest of their lives. 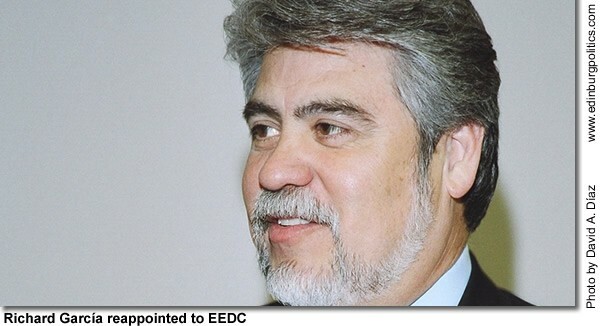 The more people are educated in how to save a life, the safer we all are,” said Hinojosa. Sen. Jane Nelson, R-Lewisville, who chairs the Senate Health and Human Services Committee, said it’s about time Texas passed this law. The bill was amended on the floor to include private schools in the requirements. The bill will permit the Texas Education Agency to accept private donations to offset the cost of these devices. Manual defibrillators work by giving the heart a controlled electric shock, forcing all the heart muscles to contract at once, and, hopefully jolting it back into a regular rhythm. Historically, only trained medical professionals were able to interpret the heart rhythms on manual defibrillator devices. However, today’s new Automated External Defibrillators (AEDs) use embedded computer chips to analyze the rhythms instantly and accurately, making it possible for non-medical professionals to administer the same vital service without risking an accidental shock. Ciro Leonel Treviño, 53, entered into eternal rest quite peacefully in the company of friends and family, Tuesday, March 20, 2007 at Doctor’s Hospital at Renaissance in Edinburg after a four-year- long courageous battle with cancer. Ciro was born October 18, 1953 to Ciro and Antonia (Toni) Anzaldua Treviño. He was preceded in death by his mother, Antonia (Toni) Treviño. He is survived by his loving and devoted wife of 30 years, Leticia Montalvo Treviño; his two sons, Robert Daniel, Aaron Andrew; his daughter, Amanda Yvette; and his father, Ciro Treviño, all of Edinburg. His father, a former longtime Hidalgo County tax-assessor/collector and Edinburg city commissioner, currently serves on the Edinburg school board. He was born and raised in Edinburg and attended Sacred Heart Catholic School, Edinburg High School, and Pan American University. 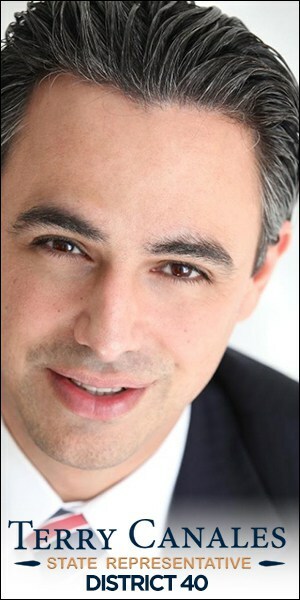 In pursuit of his love of music, Ciro earned a Bachelor’s degree in music and a Master’s degree in secondary supervision. His lifelong dream was accomplished in his 30 year profession as a band director. In his first year out of college he was hired as an assistant band director in the Mercedes School District. The following year he was hired by his alma mater, Edinburg High School as an associate band director and later became head band director. In 2002 Ciro was promoted to Director of Fine Arts where he served his remaining four years with the district before retiring in June 2006. Because of his love and commitment, Ciro touched the hearts and souls of all his students and inspired many to pursue the music profession. His compassionate, witty, and charming disposition helped him overcome any differences with some of his students. He maintained a positive attitude that would eventually win him the respect and admiration of all his students. He often expressed how lucky he was to have a job that gave him such pleasure. While in college Ciro was a member of Phi Kappa Theta Fraternity and Phi Mu Alpha Sinfonia. As a professional music teacher, Ciro was a member of the Texas Mu Educator’s Association and the Texas Band Masters Association. Ciro was a very loving and generous husband, father, son and friend. His friendly demeanor and humorous candor made him a real pleasure to be around. He will be dearly missed by his family, friends, and all whose lives he touched. 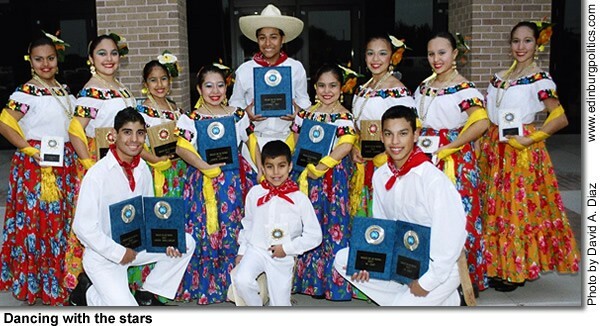 Visitation was held from 5 to 9 p.m. with a 7 p.m. rosary on Thursday, March 22, 2007, at Memorial Funeral Home, 208 E. Canton in Edinburg. Funeral service was held at 10 a.m. Friday, March 23, 2007, at St. Joseph Catholic Church in Edinburg. Interment was held at 10 a.m. Saturday, March 24, 2007, at Valley Memorial Gardens in McAllen. Pallbearers were Xavier L. Ríos, Fransisco Omar Montalvo, RR Rodríguez, David Rodríguez, Rick Pérez, Mike Pérez, Orlando Zamora, and J.J. González. Honorary pallbearers were Gerardo Montalvo, Rudy Ramírez, Wilfredo Pérez, Curtis Maynard and Robert Vela. In lieu of flowers, the family would like donations made to the American Cancer Society (local chapter), 5413 S. McColl, Edinburg, Texas 78539. Phone number (956) 682-8320, http://www.cancer.org. Funeral Service were under the direction of Memorial Funeral Home in Edinburg. Edinburg’s retail economy in January 2007, as measured by the amount of local and state sales taxes generated by a wide range of local businesses, was up 10.1 percent over the same month in 2006, the Edinburg Economic Development Corporation has announced. The figure translates into more than $1 million generated in local sales taxes in January, and sent back to the Edinburg city government on March 9 by the state comptroller of public accounts. State sales tax revenue for February, and the March 9 payments made to local governments on represents sales that occurred in January. The local sales taxes are generated by the city’s 1 1/2 local sales tax and the 1/2 economic development sales tax that is administered by the EEDC. 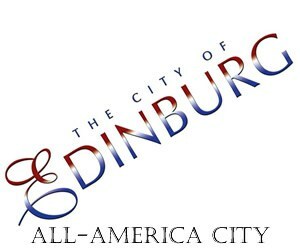 In January, Edinburg’s economy generated $1,015,366.40 in local sales taxes, compared with $922,972.84 in local sales taxes in January 2006. 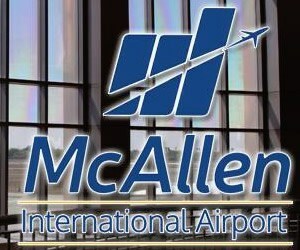 McAllen’s economy generated more than $4.1 million in local sales taxes in January, compared with more than $3.6 million during the same month last year. According to the comptroller’s office, Hidalgo County also showed continued prosperity. In January, 2007, all cities in Hidalgo County generated more than $8.8 million in local sales taxes, up 12.06 percent over January 2006, which reached more than $7.8 million. In January, all cities in Cameron County generated almost $4.5 million in local sales taxes, compared with $4.2 million during the same month in 2006, a increase of almost 5.8 percent. •Weslaco’s retail economy generated almost $681,000 in local sales tax activities in January 2007, compared with almost $643,000 in January 2006, an increase of more than 5.8 percent. Statewide, Texas Comptroller Susan Combs announced state sales tax revenue in February totaled $1.65 billion, up 7.0 percent compared to February 2006. Combs delivered $396.8 million in March sales tax payments to Texas cities, counties, transit systems and special purpose taxing districts, a 5.6 percent increase compared to March 2006. So far this calendar year, local sales tax allocations are up 5.5 percent compared to the first three months of 2006. Combs sent March sales tax payments of $268.6 million to Texas cities, up 5.1 percent compared to March 2006. Calendar year-to-date, city sales tax allocations are running 6.5 percent higher than last year. Texas counties received sales tax payments of $24.2 million, up 5.9 percent compared to one year ago. Calendar year-to-date, county sales tax allocations are 7.6 percent higher than last year. The 115 special purpose taxing districts around the state received $11.8 million in sales tax revenue, up 9.3 percent compared to last March. Ten local transit systems received $92 million, up 6.4 percent. For details of March sales tax payments to individual cities, counties, transit systems and special purpose districts, locate the Monthly Sales and Use Tax Allocation Comparison Summary Reports on the Comptroller’s Web site at http://www.window.state.tx.us/taxinfo/allocsum/compsum.html. The Comptroller’s next sales tax allocation will be made on Friday, April 13. A bill that would automatically keep secret most personal information about people who are helped financially by a state crime victims compensation fund was unanimously approved on Tuesday, March 20, by the Texas House of Representatives. 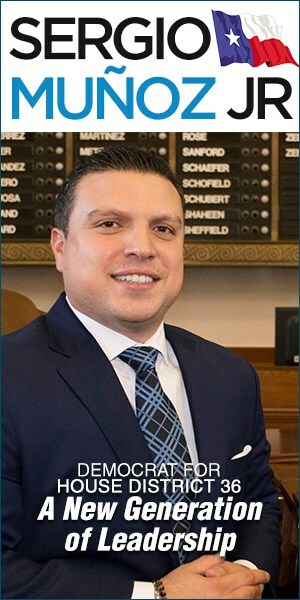 The measure, House Bill 1042 by Rep. Aaron Peña, D-Edinburg, keeps confidential key information about victims and claimants held by the Office of Attorney General’s Crime Victims’ Compensation Program. 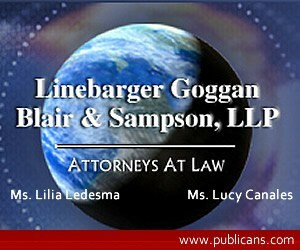 Under current law, after three years, the victim must request that his/her personal information remain confidential. Also, claimants – usually family members or survivors of victims that are seeking financial help on behalf of the victims – have no confidentiality protections. The measure was opposed by the Texas Daily Newspapers Association, which contended, according to the House Research Organization, that keeping secret the information of all people involved with the crime victims’ compensation fund for long periods could inhibit the press from monitoring the fund, from verifying victims’ information, and from approaching victims to determine if they want to tell their stories to the news media. 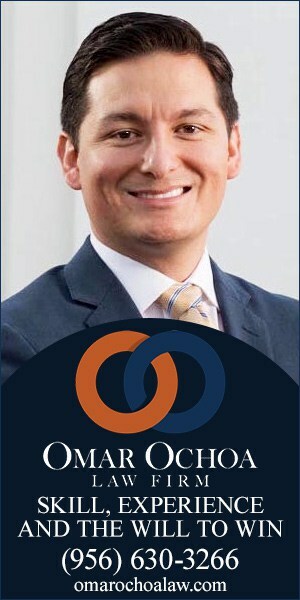 The House Research Organization is a nonpartisan organization, funded by the House of Representatives, which provides detailed background on all major legislation, and strives to provide as many sides to the issue as possible. The legislation would keep private the social security number, address or any other information that would reveal the identity of the crime victim or claimant. The Crime Victims’ Compensation Program allows reimbursement of lost wages, medical expenses, burial expenses and other costs incurred as a result of a violent crime. “Victims of crime and their families do not need to fear that their address, social security or phone numbers will be available to those same people who perpetrated the crimes against them,” said Peña. The bill was filed in part as response to the highly publicized case of Gloria Amaya of Austin, an employee with the Texas Comptroller of Public Accounts, who was repeatedly stabbed and critically injured by her estranged husband in June 2002. The assault took place in a parking garage as she was leaving work. Following the stabbing he fled the scene and took his own life and the life of his and Gloria’s 12 year old son. Soon after the tragedy, then-Comptroller Carole Keeton Strayhorn refused to release a photograph of Amaya to an Austin television station, KEYE, which had requested copies of her state security badge photo. “I have always been a staunch supporter of conducting government in the sunshine. The right of the people to observe and question their government as it conducts their business should be absolute – so long as it does not violate the privacy rights of an individual citizen, which I believe is the crux of why we are here today,” Strayhorn said in September 2002. “The next day, an Austin television station, KEYE, requested copies of Gloria’s state security badge photo. I saw no reason to release the photographs. I believe to release the photographs would have been a gross invasion of privacy,” she continued. The companion (identical) bill, Senate Bill 636 by Sen. Glen Hegar, R-Katy, has been referred to the Senate Criminal Justice Committee. Sen. Juan “Chuy” Hinojosa, D-McAllen, is one of the seven members of the Senate Criminal Justice Committee. 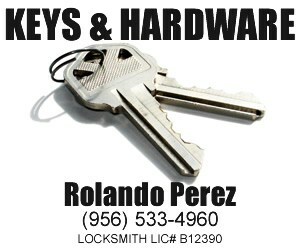 Orlando Salinas contributed to this story. Congressman Rubén Hinojosa, D-Mercedes, on Thursday, March 22, issued the following statement regarding the announcement today of bipartisan comprehensive immigration reform legislation, Security Through Regularized Immigration and a Vibrant Economy (STRIVE) Act of 2007. “I applaud Congressmen Luis Gutiérrez, D-Chicago, and Jeff Flake, R-Mesa, Arizona, for their efforts to address comprehensive immigration reform. It is clear that our immigration system is broken, and it is critical that we have legislation in this country that offers up a sensible solution. This bill recognizes the fact that we cannot fix our immigration process without addressing all sides of the equation—enforcement, border security, processing backlogs, our workforce needs, and our large population of undocumented immigrants. Most importantly, this bill presents Congress with a reasonable launching point from which I believe we will be able to craft broad reform. “As chair of the Subcommittee on Higher Education and the Congressional Hispanic Caucus Education Taskforce, I am particularly pleased to see the inclusion of the Development, Relief, and Education for Alien Minors (DREAM) Act in Congress’s renewed quest for immigration reform. Without this legislation, too many of our nation’s talented immigrant students will be forced to forego their pursuit of a higher education. It is essential that we provide a way for our undocumented students who grew up in this country to attend college, have access to financial aid and grants, and earn legal permanent residency. The Texas Racing Commission (TRC) on Tuesday, March 20, issued a Class 2 horse racetrack license to Valle de los Tesoros, Ltd. (VDLT), opening the door for construction on a project that will bring new jobs and revenue to the Rio Grande Valley. The proposed Valley track, which reportedly will involve up to a $23 million investment, received unanimous support from the six TRC commissioners in attendance. VDLT is a company headed by the LaMantia family of McAllen, which is active in political, community and charitable affairs. They own L&F Distributors, which features Budweiser. VDLT predicts that the first year impact to the local economy will be worth approximately $91 million and will generate approximately 1,200 jobs. Once operational, the racetrack will have an annual budget of approximately $4.2 million, of which $1.4 million will be spent on salaries and wages. VDLT also projects that the track will have a positive impact on local agribusiness, which will translate into jobs for feed suppliers, farmers, veterinarians, and other track-related positions. 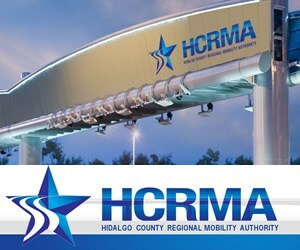 The track will be located on a 200-acre site near Dodge Arena in the city of Hidalgo at 10th Street and Dicker Road, just south of the McAllen city limits. According to the Texas Horse Racing Commission, VDLT said the facility’s grand stand will provide live views of horse racing between February 23 through April 1 of each year, with the grandstand capable of seating 1,035 people. An indoor air conditioned, 25,000-square-foot area will feature simulcasts of horse racing from other venues, with a seating capacity of 350 persons. On an annual basis, VDLT estimates 43,222 persons will attend the live views of horse racing between February 23 and April 1, while 190,655 patrons will show up for the indoor simulcasts. Horse-racing tracks are classified as class 1 racetracks, class 2 racetracks, and class 3 racetracks. A class 1 racetrack is a racetrack on which racing is conducted for a minimum of 45 days in a calendar year, the number of days and the actual dates to be determined by the commission under Article 8 of this Act. A class 2 racetrack is a racetrack on which racing is conducted for a number of days not to exceed 44 days in a calendar year except as otherwise provided by this section. The commission may permit an association that holds a class 2 racetrack license and that is located in a national historic district to conduct horse races for more than 44 days in a calendar year. A class 3 racetrack is a racetrack operated by a county or a nonprofit fair under Article 12 of this Act. An association that holds a class 3 racetrack license and that conducted horse races in 1986 may conduct races for a number of days not to exceed 16 days in a calendar year on the dates selected by the association. Rep. Verónica Gonzáles, D-McAllen, on Monday, March 14, was appointed by Speaker of the House Tom Craddick, R-Midland, to serve a two-year term on the Health Committee of the National Conference of State Legislatures (NCSL). The health committee is composed of state legislators who will work together to create policy guidelines on a variety of issues ranging from cancer prevention and control, children’s health insurance, disease prevention, health care insurance and substance abuse. “I am eager to use my experience on the House Public Health Committee to work for state-federal health policy development,” Gonzáles said. “This appointment is a vital opportunity to further advocate for South Texas’ health needs.” The committee helps to develop policy on state-federal issues and guide the lobbying efforts of NCSL. As a member of the NCSL Health Committee, Gonzáles will be responsible for participating in legislative forums which focus on policy innovation among different legislatures and guiding the NCSL’s lobbying efforts at the federal government. Gonzáles represents House District 41, which is contained entirely in Hidalgo County and includes portions of McAllen, southwest Edinburg, and Mission. The Senate Committee on International Relations and Trade on Monday, March 19 unanimously recommended passage of Senate Bill 99 by Sen. Judith Zaffirini, D-Laredo, which would support persons living in Texas’ most impoverished communities by increasing the number of state agencies required to submit data about projects that serve colonias. The bill also would increase accountability of the logistical and financial reports regarding colonia improvements made by agencies and by state and local governments. A number of specific problems affect not only colonia residents, but also the legislators and state agency staff who are charged with developing projects to assist colonias. Current laws intended to prevent the proliferation of colonias take a variety of forms and apply in a variety of circumstances. While the legislature has refined these laws during the last 15 years, several laws apply only in the border area or in “economically distressed” counties with high unemployment and low per capita income. Application and proper execution of these laws relies on complete and accurate demographic information collected about colonias and colonia residents. What’s more, state agencies often lack comprehensive demographic data about colonias that is necessary to develop programs to address the needs of residents. SB 99 builds on Zaffirini’s legislation that improves and increases access to state services for colonia residents. In 2005 she authored and passed SB 827, which required the establishment and maintenance of a statewide system to identify and classify colonias with the highest health risk to residents. SB 827 also directed a state agency work group to develop a report regarding the progress of state-funded projects in providing water or wastewater services, paved roads and other assistance to colonias. 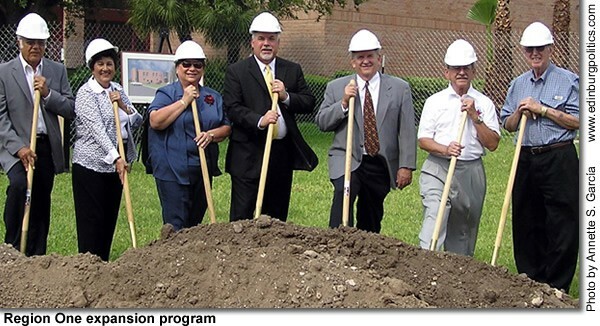 This report was published on December 1, 2006, and provides a comprehensive overview of the colonias in Texas as well as a complete summary of colonias projects. SB 99 would further improve the colonias reporting process and would implement several of the state agency workgroup recommendations. House Bill 479, which outlines the succession of the La Joya Water Supply Corporation, passed the House on Thursday, March 22, said Rep. Ismael “Kino” Flores, D-Palmview, who authored the legislation. The bill transfers the necessary authority to the La Joya Special Utility District and is the latest effort to reform the much-maligned LJWSC and providing quality water service to residents served by the utility. The bill now heads to the Senate, where Sen. Juan “Chuy” Hinojosa, D-McAllen, will be the sponsor of the legislation. Currently, LJWSC is under receivership. The bill authorizes the current receiver to make all necessary steps to allow the Texas Commission on Environmental Quality to transfer essential operating permits to the La Joya Special Utility District. Additionally, the bill establishes a temporary board until a uniform election is held. It would also require the temporary board to receive training and establish an education program for the elected directors. The La Joya Water Supply Corporation supplied water and wastewater service to residents in the western part of Hidalgo County and the eastern part of Starr County. As a non-profit water supply corporation, there was little if any oversight of the business operating procedures by state agencies. La Joya Water Supply Corporation’s lack of institutional oversight and specific guidelines regarding operations of the corporation resulted in below par administrative and managerial proceedings with respect to its day-to-day activities. During the 79th Legislative session, HB 1358 was passed and the La Joya Special Utility District was created. HB 479 deals with the succession of the La Joya Water Supply Corporation by the La Joya Special Utility District. Currently, the La Joya Water Supply Corporation is under receivership. The bill would authorize the current receiver to take all necessary steps to allow the Texas Commission on Environmental Quality to transfer the Certificates of Necessity and Convenience to the Special Utility District. The bill would also establish a temporary board of directors for the Special Utility District, until a uniform election is held. It would also require the temporary board to receive training and establish an education program for the elected directors. Congressman Henry Cuellar, D-Laredo/McAllen, on Wednesday, March 21, announced that the planned Anzalduas Bridge has received $7,478,000 from the General Services Administration (GSA). The GSA was able to secure the final portion of the $25,200,000 needed to complete funding for the Border Inspection Facilities at the Anzalduas Bridge. The Anzalduas Bridge – a joint project between the cities of Mission, McAllen, and Hidalgo — will be located approximately five kilometers up the Rio Grande from the Hidalgo-Reynosa Bridge, connecting Mission with Reynosa. Cuellar is a member of the House Homeland Security, Small Business, and Agriculture Committees in the 110th Congress; accessibility to constituents, education, health care, economic development, and national security are his priorities. Congressman Cuellar is also a Majority Senior Whip. 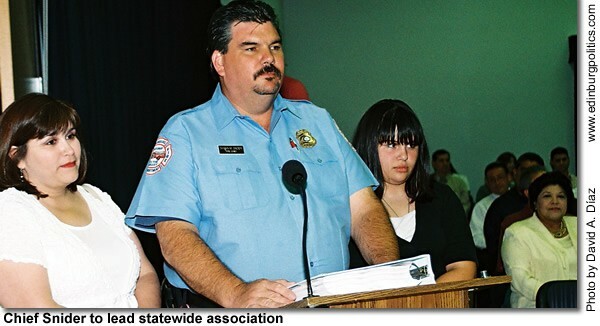 Sen. Eddie Lucio, Jr., D-Brownsville, on Wednesday, March 21, commemorated the life of his longtime friend and colleague, the former Sen. Frank Madla, Jr., by proclaiming March 21, 2007, Smoke Alarm Awareness Day at the State Capitol. Co-authoring Senate Resolution 491 is Sen. Leticia Van de Putte, D-San Antonio. March 21 was also Firefighter Legislative Day sponsored by the State Firemen’s and Fire Marshals’ Association. “Having smoke alarms in every home can avert fire tragedies and loss of precious lives, such as those of Mrs. Mary Cruz (Sen. Madla’s mother-in-law), Sen. Madla, and his precious granddaughter Aleena (Virginia Jiménez)” said Lucio. “The family died as a result of a fire in the San Antonio home of the Madla’s Nov. 24, 2006. Sen. Madla’s wife, Helen, survived despite injuries. She attended the event with three relatives. The National Fire Protection Association reports that more than 700 lives could be saved every year by the presence of a working smoke alarm in every home. The death rate from home fires has been reduced by half since battery-powered smoke alarms became available in the 1970s. Fire deaths could decline an additional 36 percent if every home had a working smoke alarm, ideally in every room. Smoke alarms should be tested regularly and batteries should be replaced twice a year. Legislation introduced by Congressman Hinojosa to tackle “alarmingly low” graduation rates in U.S.
Rep. Rubén Hinojosa, D-Mercedes, on Thursday, March 22, reintroduced legislation that would combat the alarmingly low graduation rates among Hispanic students and other at-risk groups. H.R. 1623, The Graduation for All Act, will authorize $1 billion for fiscal year 2006 to address the graduation crisis at hand. Funds will be used to establish high school literacy programs and provide on-site faculty development through the use of literacy coaches. Additionally, this legislation provides resources to schools to develop individualized graduation plans for students most at risk of not earning a diploma. Finally, the bill strengthens accountability by requiring state and school districts to disaggregate data on graduation rates by race, ethnicity, income, disability status, and limited English proficiency status. The dropout statistics in America are alarming: Currently, 10 percent of public school students who begin ninth grade in September drop out before graduation. Only five in 10 Hispanic and African-American students graduate on time. Studies show that each class of high school dropouts costs the nation more than $200 billion in lost wages, tax revenues, and spending for special support programs. A program that was supposed to save the state millions of dollars and enhance services to needy Texans did exactly the opposite. Many reasons and excuses have been offered for the failed performance of Texas Access Alliance, a private consortium led by Accenture, a management consulting firm based in Bermuda. Accenture contracted with the Health and Human Services Commission (HHSC) for $899 million to privatize several social programs for the state, such as the Children’s Health Insurance Program (CHIP), Medicaid, Food Stamps and Temporary Assistance to Needy Families (TANF). 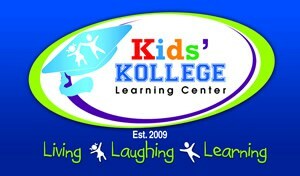 The contract was terminated March 13, 2007, because it failed miserably to provide services or save money. However, those responsible for touting its leading-edge capabilities cannot wash their hands of the matter. I joined 30 senators in signing a letter requesting the Office of Inspector General of HHSC to investigate this transaction. In 2003, I vehemently opposed House Bill 2292, the legislation that created this fiasco by reorganizing what was then the Texas Department of Health and dividing some of its departments into other agencies. I voted against this bill because I did not feel that the administration of programs like CHIP and Medicaid should be subjected to uncertainty. When it comes to basic human rights like child health, people must come first. This proposal to exchange face-to-face services with call centers so that Accenture could make a profit at the expense of our needy citizens signaled a red flag from the very beginning. Yet the bill passed. I don’t oppose outsourcing or profit-making, but not on the backs of the poor or hard-working. I generally favor private-public partnerships, because these arrangements often offer more accountability to the taxpayers. I was opposed to the Accenture contract because it meant putting hard-working employees—sometimes employed for 20 or more years—out on the streets. Any money saved would be offset by making productive citizens wards of the state. Displaced workers from the privatization could not have quickly or easily found work, and would have suddenly been deprived not only of a paycheck, but also of health insurance, retirement savings and the dignity to earn a living. Another grave concern of mine was risking or endangering someone’s health or welfare. And unfortunately it did. Accenture mismanaged records and documentation, and was continuously behind schedule in updating records and organizing call centers. The inefficiency was so severe, that names of children and persons eligible for state social services disappeared from enrollment data. CHIP’s operations, assumed by Accenture on Dec. 1, 2005, caused enrollment to plunge by 8.5 percent, or a loss of 27,567 children, through August 2006. Medicaid enrollment dropped 2.9 percent, or 53,937 children, for the same period. Tragically, Devante Johnson died, a 14-year-old cancer patient who was dropped from Medicaid enrollment. The suffering was widespread throughout the state, but it was more pronounced in high-poverty areas like South Texas and along the Border. The Accenture contract has cost the state $100 million more than budgeted, while fewer children and families received the needed benefits. This troubled arrangement with Accenture, since its inception, lost CHIP applications, leaving children unable to visit their doctors, with no one accepting accountability. Ill-trained workers, instead of competent state employees, were making policy decisions they were unable to make. Fortunately, the plan to scrap thousands of state jobs was canceled late last year. Termination of the contract does not answer the many questions still unanswered nor does it replace the financial and emotional havoc it wreaked. It is time that we ask and receive accountability through an audit. We owe it to the families who have suffered. We owe it to Devante Johnson’s family. We also owe it to the state employees who lost or almost lost their jobs. And in good conscience, we owe it to the taxpayers who footed a bill with zero returns on their dollars. I vow to keep an eagle eye on the rebuilding process to ensure that this mistake is never again repeated. Gov. 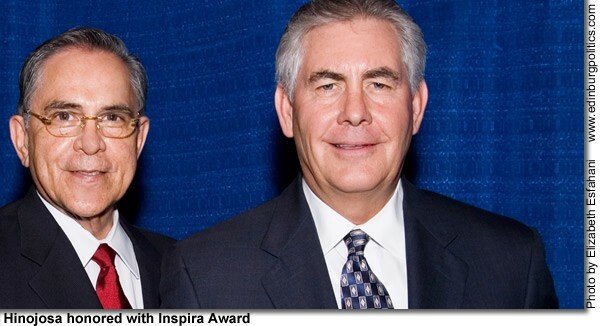 Rick Perry on Friday, March 23, was honored as Texan of the Year by the 41st Legislative Conference. Serving more than 22 years in Texas state government, Perry continues to champion a variety of issues important to the state, including health care, education and transportation. Speaking to more than 500 government, business and education leaders, Perry emphasized the importance of leadership in public service. Highlighting several achievements during the six years of his administration, Perry spoke about his h2 personal philosophy and values on leadership. Perry addressed two important issues facing the legislature: transportation and higher education reform. Perry’s plan dedicates an addition $1.7 billion to financial aide and performance incentives for colleges and universities. The U.S. Senate Judiciary Committee on Thursday, March 23, unanimously approved bipartisan legislation introduced by U.S. Sen. John Cornyn, R-Texas, that takes critical steps to fight genocide. The Genocide Accountability Act, S. 888, now moves to the full Senate for consideration. The bill, introduced with U.S. Sen. Richard Durbin, D-Illinois, would close a current loophole in federal law that prevents the U.S. Justice Department from prosecuting aliens in the United States who have committed genocide in other countries. “We must hold those guilty of atrocities responsible and ensure they are brought to justice. By closing the current loophole in federal law, this bill takes important steps to rid the world of genocide,” said Cornyn, a member of the Judiciary Committee’s Human Rights and the Law subcommittee. “The genocide in Darfur has become the world’s most dire human rights and humanitarian crisis. I’m encouraged that this legislation is moving forward and urge my colleagues to support it in the full Senate,” he added. The bill is co-sponsored by Sens. Tom Coburn (R-Okla.), Russ Feingold (D-Wis.) and Patrick Leahy (D-Vt.). The Justice Department has identified individuals who participated in the Rwandan and Bosnian genocides and are living in the United States under false pretenses. Under current law, these individuals cannot be arrested or prosecuted for genocide because they are not U.S. nationals and the acts in which they were involved did not take place in the United States. In contrast, the laws on torture, material support for terrorism, terrorism financing, and hostage taking, are among the crimes that federal prosecutors can charge despite having been committed outside the United States by non-U.S. nationals. The Genocide Accountability Act developed out of the first hearing of the Human Rights and the Law subcommittee, established this year. The February hearing addressed the genocide in Darfur and other parts of the world. The bill has been endorsed by numerous human rights organizations. On a related note, Sen. Cornyn recently introduced the Sudan Divestment Authorization Act, S. 831, which will increase pressure on the Khartoum government to stop the genocide in Darfur. The legislation provides federal support for state and local divestment efforts and expresses the sense of Congress that states and other entities should be allowed to divest their efforts of certain holdings in opposition to the genocidal policies of the Sudanese government and authorizes—though does not require—such divestment.